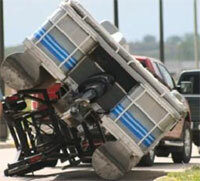 We’re careful when selling a center-lift pontoon trailer to stress that this type of trailer can be “tippy”. If you clip a curb with some brands you will likely tip the boat. But center-lift trailers are good for launching in shallow water or storing a boat in a building with a low overhead door. People often go together to buy a community trailer to handle multiple boats and that’s another reason to buy a center-lift trailer. Some older 22’ or even 24’ pontoons only have a 20’ deck and the LL-20 could work. 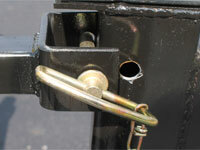 For shorter boats use the optional adjustable bow stop for a better fit. Trailers are 44” wide. Fits modern 8’6” wide two tube boats with larger tubes. Will accommodate most 8’ (96”) wide pontoons with large tubes. Lifts 40” off the ground (clearance for the largest tubes). Lowers to 23” (sits most pontoons down on the ground without blocking). 4000 lb. carrying capacity. Tandem axle with sure lube hubs (grease zerks beneath the rubber cap on the hub). 12” radial tires on galvanized rims (ST-145R12E Range). 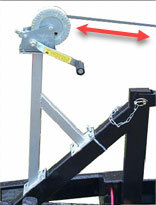 The trailer raises and lowers through a 7 pulley lifting system with a 1500 lb. winch. The lifting system is in the stern because that’s where the weight is on modern pontoons. The lifting arms are 2” x 2”, 12 gauge steel. 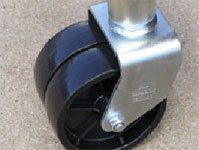 A dual wheel tongue jack is standard. DOT approved LED tail lights in protective cages to prevent damage. Modern Powder-Cote finish keeps your trailer looking new for years. 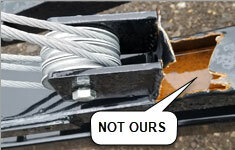 The trailer takes a 2” ball with the standard trailer flat 4 plug wiring. Our low-slung suspension allows wheels to walk over pot holes. If you hit a curb, because of our low center of gravity, the frame is less susceptible to tipping. Our axles are only 6” off the ground. Our 20’ trailer weighs 825 lb. The 24’ trailer weighs 900 lb. Some trailers weigh as little as 500 lb. When a boat is riding on a narrow wheel base frame, the heavier the trailer, the better it will track and handle. Turn the winch and cables move through the pulley system raising or lowering the frame. The 1500 lb. winch working through 7 pulleys yield a terrific mechanical advantage. The frame pivots on 2”-12 gauge steel arms, the strongest available. The weight is carried by these arms. In the up position the weight is transferred to the bottom frame. Our arms are straight up and down when fully raised. Lifting in the stern is a great advantage. Modern boats have all the weight in the back. Our two stage pulley lifting system is the strongest available. Lifts the heaviest boats with ease. Our Lo-Loader trailer has been in production for twenty years. The bolts in the pivot arms run through a bushing, not just through a hole that will widen out. 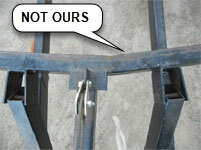 Stress points are reinforced with welded gussets. Your boat never rides on cables. transoms. Standard adjustable bow stop. Allows you to move the stops on the frame. 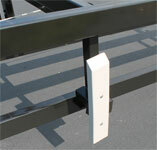 Adjust the length to fit the deck of your pontoon. Mounts to the front frame. Doesn’t interfere with up/down operation. strap with an eye in the end. 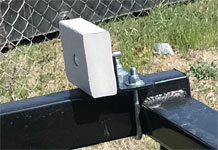 Lo-Loaders are easy to load but the front loading winch is good protection to help pull or hold the boat on the trailer. If you clip a curb with this style of trailer the frame is 32” off the ground and the top is tipped at a considerable angle. You could easily tip the boat. Wanna Save a Couple Hundred Dollars on a Center-Lift Trailer? We can’t help you. We won’t sell a single axle center-lift trailer. We won’t sell a trailer with a weak lifting system. 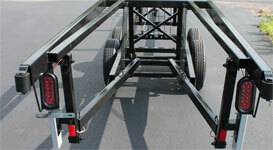 We’ve sold single axle trailers in the past but customers tipped their boats we decided it wasn’t worth it. People usually never consider that their boat is often underinsured. Many have a $500 deductible. Worse yet, your beautifully restored 15+ year old pontoon if damaged is not insured for what you’ve got in it. Insurance generally only covers the depreciated value, often only a couple thousand dollars. Tip it over and you’ll regret the couple hundred dollars you saved on a trailer. trailer manufacturers. They know about stress points. These trailers have front lifting systems. The weight of the boat has bent the frame on the trailer to the left. The trailer to the right has a stronger (multi pulley system) but the stress has actually torn the steel. Here’s how one company handles different length of boats. They have a bottom frame that’s one length and they add length to the top frame. When the customer put his 26’ boat with a 150 HP engine on this trailer it wouldn’t crank up. This is an attractive trailer but you don’t need to be an engineer to know that weight overhanging a pivot point on a cantilever system is multiplied by two.